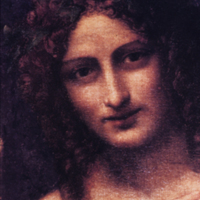 This painting was first described in the French royal inventory as Saint John the Baptist in the Desert, then at the end of the 17th century, possibly as the result of a restoration, as Bacchus in a Landscape. 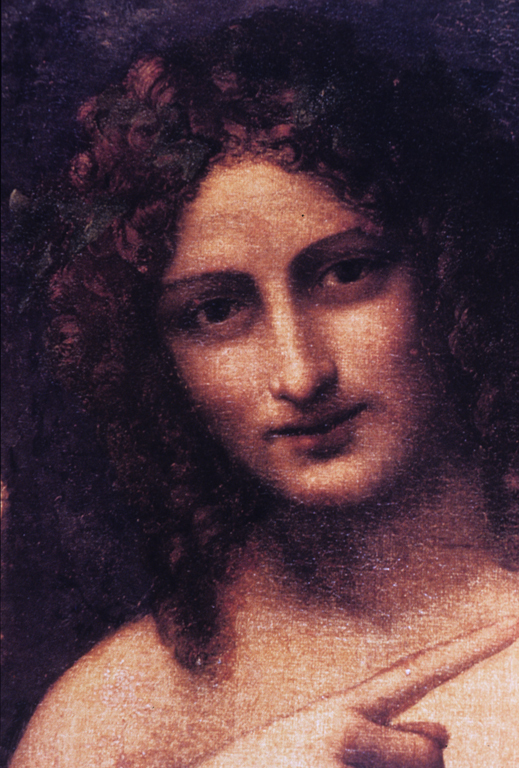 Like Leonardo's half-length portrait Saint John the Baptist, it is a syncretic work. The index finger pointing upward toward a divine sign and the deer are Christian symbols. The thyrsis, the crown of vine leaves or ivy, the bunch of grapes, and the panther skin are attributes of Bacchus. It is thought that the painting was executed by one of Leonardo's pupils from a composition contained in a drawing attributed to the master (ex-Museo Baroffio, Varese, stolen 1973) dating from 1510-1513.
workshop of Leonardo da Vinci (Italian artist, 1452-1519), “Saint John the Baptist Seated in a Landscape,” Institute Images Online, accessed April 24, 2019, http://westerncivart.com/items/show/2933.